Yesterday I mentioned about how not to spend lots of money at the start of your business, and one of the things I mentioned was having a good support network. Now I need to make that clear, having a good support network is different to having a mastermind or being a member of a mastermind. A support network is the people around you — your friends, the people that can support you. Now that does involve family. So be very careful. So I’m going to go through the people bit by bit. Be very careful with family because family know you well. And unless they’re doing what you are trying to do, they may not fully agree with it. They may feel that you’re doing something wrong. So be careful because they may be looking after what they feel are your best interests. However, they may just be adding negative thoughts into your head and putting you off. You’ve never done this before. What do they know about it? So be careful with family and telling them too much. But close family — spouse, children, they need to be supportive of what you do. So don’t expect them to contribute if they don’t want to. Try and help them understand what you’re doing. It’s the why. So part of getting a good support network is having them understand your why. The why you are doing this and the why is big. If you start with the why then you know what you’re doing. Now if you can convince others of the same, they will be able to support you. So that’s the family side. Now when it comes to friends, and when I mean friends, I mean mates— I mean your good mates. The ones you get in the pub with, the ones you hang out at the gym with— those kinds of friends. The friends that have nothing to do with your work or business. They are not very helpful. So as a friend, and this is a different thing. As a friend outside of work, great! But don’t discuss your work issues and problems with them because they do other things. They have other interests in life. And if they ask, and if they are proactively supportive– they ask you about what you’re doing, that’s different. But as a rule, for most people I know and most people I’ve spoken to, their friends are a negative influence and they add to the self-doubt and make you think, am I doing the right thing if so many people are against it? And that’s because sometimes they may actually be jealous of what you’re doing or jealous of your potential success or your success. They may not understand it. They may be suspicious. That does not help you. That’s not good so be very careful with friends. 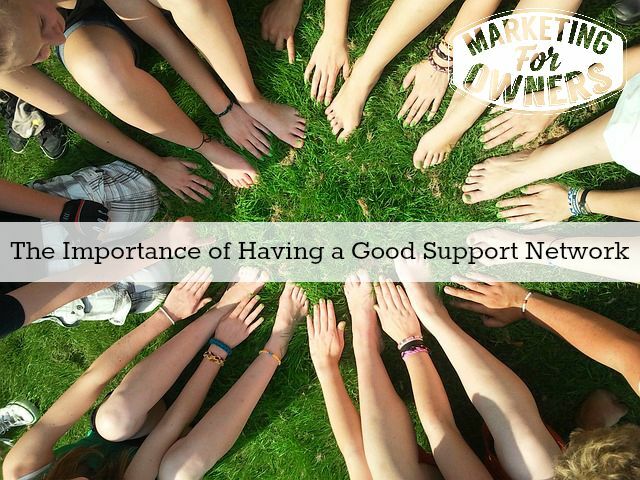 Now your best support networks are people who are in business, okay? Figure out who among your family and your friends are in a kind of position like you. So in other words, they may be entrepreneurial, they may have started a business, they may be in senior management, they may have been in business for a long time. Don’t worry about age groups, its experience you’re looking for. People, who can empathize with you. People who understand what you’re going through. That’s who you need to be in your support network. It is very, very important. Being a boss, being a business owner, being an entrepreneur, is an extremely lonely profession. The reason for it is because you have staff and work colleagues but they work for you. Either they won’t feel comfortable telling you how it is, for real, they’ll just tell you what you need to know. Or, they’ll just look at you as a boss and that’s that. And that’s a very different relationship. When they go down, or when they go out for weekend, go to a party and they hangout with their work colleagues—their work colleagues, their work colleagues. But when you turn up, you are the boss. You might be fun, you might be wonderful, you might have big smiles all the time. You might sing to them, you might go to the Christmas party and still be the life and soul of the party. But you’re the boss, it’s not the same. You need people who are kind of in a similar position. Another one to pick-up support network is get to know people in your trade. Join a trade association and go to meetings. Go to the AGM. It may sound boring but trust me, all the other people there are just like you. There aren’t going to be new, wide-eyed people who have no idea what’s going on, who want people like you to be friends. There are going to be people who are very experienced, been there, done it all, who desperately want to help new people, new blood into the industry because they understand. They want to help you. It’s not going to cost you anything. These people will become your friends. I have friends— people who can remember when my kids were born, whom I have never met, who are all over the country, of all ages. I can remember when their kids were born. We have no working relationship whatsoever but we can talk to each other. We understand. So that’s what you need and you need business people, people who are going to help you. Now, today, it is Wednesday, time for a friendly follow. Now, this one is going to be unique. 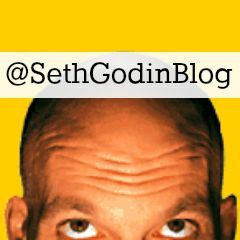 Today, I am going to recommend my good old pal Seth Godin. Now, his handle is: @sethGodinBlog. Now the reason this is unique is because Seth does not use twitter. His staff tweets snippets from his daily blog posts. He also is unique and his blog posts are really, really short. Everyone else’s have to be long. He has millions of daily readers. And the reason is because he is a true thought leader. The stuff that comes out of Seth’s brain is quite remarkable. It’s so insightful and it seems so obvious when you hear it. It’s brilliant! That’s why his books are good. But so are the tweets that lead to his blog and his blog posts are great. Normally, I would not recommend somebody who doesn’t like twitter and just gets his staff to do it. He doesn’t hide behind it. He doesn’t care because he knows he’s good. Go follow Seth, see what he’s up to. I recommend him. What type of network do you have in place?